By quiet I mean all the Setswana seem to have gone elsewhere for Christmas. Dead quiet. In preparation for the wedding just days after Christmas, every person over the age of fifty was gone for several hours at a time. The Tswana family unit is built on a patriarchy that establishes not just the parents as “parents” but the uncle, too. For example, the groom and his entire family was from Ireland. While the groom was represented by his biological parents in the days leading to the wedding, the bride was represented by her uncle, and secondarily, the biological parents. The maternal uncle is accorded a special place and in the groom’s wedding (Call him B) this was no different. B’ s parents faithfully attended wedding planning meetings four days beforehand. As B and his family were not familiar with the Tswana family unit traditional meetings, they were often frustrated to discover the meetings did not always start on time and the bride’s uncle, Mr W as we’ll suggest he should be named, was playing the title of negotiator. As Mr W was promising to represent as much as possible the wishes of B and the ‘foreign’ side of this wedding it was easy to see the conflict of interest from the start. Patlo is known as the seeking ceremony, wherein the groom intends to seek the hand in marriage of the daughter of the Botswana family. Patlo can apparently continue for weeks before the bride’s family consents to a wedding. In B’ s case, this had been negotiated months before when he invited the family to Gabs from Ireland. Naturally this would not have been planned without the prior consent of the family. For the sake of tradition, however, Patlo would continue for 3-4 days rather than the usual several weeks. When B’ s parents day in and day out would wake at 5am (or earlier) as the Setswana people usually begin their days at dawn, no matter whether ceremonial, horticultural or business, you can imagine how tired they were. The Irish are hard working as we know, but this was Christmastime. It did not matter – there was no rest for the weary. As a clumsy, innocent bystander, I felt shamelessly useless. What could I do? Not much. This is why you found me either at the mall with a coffee or by the pool… or… well let’s face it, creative candy construction was the epitome of my artistic know how that week. Yes, I made a gingerbread house. So what. (Photos later) Secretly all grown up children want one of those. Back to the seeking ceremony. In Setswana culture, the boy’s family leads a delegation to the girl’s family. After the successful first meeting and lots of structured discussions, the bride’s family makes the decision to accept the offer of marriage. Soon after there is another group of females from the groom’s side, in this case B’ s aunt, M, and his mother. They went to the bride’s male side to “wash the words of the men” and finally, to accept the bride and her family’s consent. This to me, shows the extent of how the patriarchal system is still an integral part of Botswanian life. While of course this was mainly tradition, (after all, how can one decide last minute ceremony decisions for a wedding when you have to pay in advance?) It was fascinating how often the men made decisions. Even when the women were involved in decision-making, they were to “wash the words”. Whose words? The men’s. After all, the man is the one with the voice. As mentioned, I felt useless. But I enjoyed seeing what kind of wedding this would turn out to be. I wasn’t the only bystander though, but approximately four of us in our twenties and thirties who were either not old enough to take part of wedding discussions but we’re simply *gasp* unmarried. Plus one more cousin who arrived the night before the wedding. Oh so fashionable! As stated about being single and unattached… When it comes to a wedding, a bride and groom need counsel. On the one hand, this makes logical sense. A woman and man who have been married could provide sage advice based on their experiences. Have I mentioned that M was unmarried and so was P, the other uncle of B? Ah yes. Poor B must live with marriage advice from experienced and wiser family members (both over 60) who are both unmarried. I chuckle because both are lovely people and B is lucky to have them; I just cannot imagine what the Setswana were thinking. So..the four of us stayed out of the elder meetings for several days and ran random errands when we were asked. But truly our main task was to cheer up B, who came back to the lodge every night exhausted because his new in laws were trying to change something else in the next Patlo meeting. Needless to say we had an important job. Poor B looked like one of those cute animals I kept seeing try to cross the road who obviously have good intentions but have a sad look in their eyes. Poor guy just wanted to get married. Elopement was looking pretty good. To be c o n t i n u e d . . .
One of the many creatures used for labour in Africa. 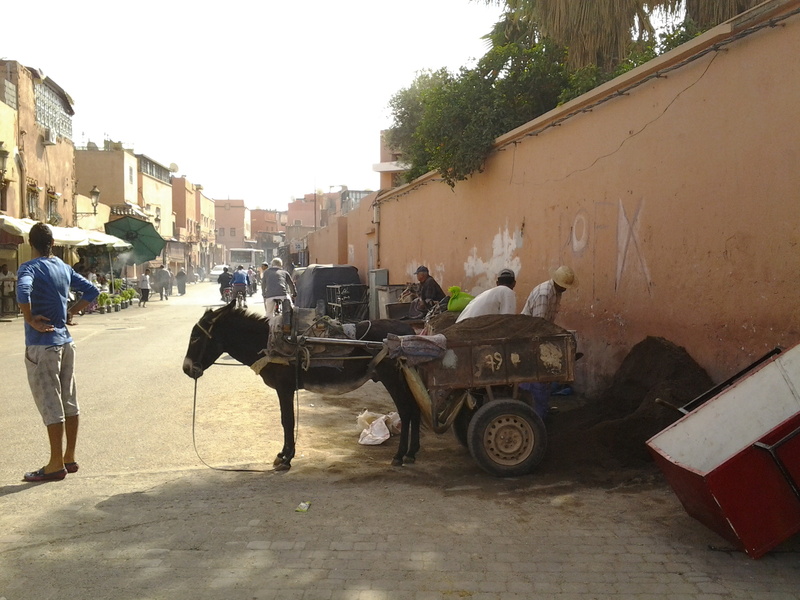 This photo was snapped in Marrakech but you find hundreds of these in Southern Africa, like Botswana.